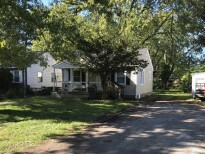 HUGE potential in this 2 bedroom in established north east Indy neighborhood. Enjoy summer nights on your covered porch leading to the nice landscaping. Original wood floors can be revived throughout home. Put your touches on this home today!